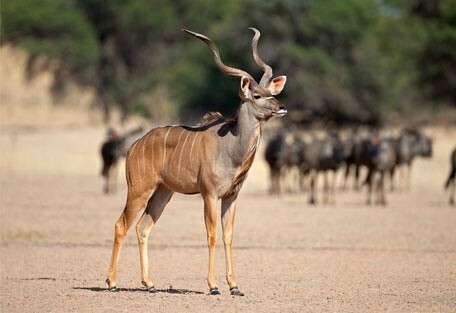 The park straddles the border between South Africa and Botswana and comprises two adjoining national parks: Kalahari Gemsbok National Park in South Africa and Gemsbok National Park in Botswana. Kgalagadi means "place of thirst", which is aptly sums up the Park's arid state, as it is located largely within the southern Kalahari Desert. The terrain consists of red sand dunes, sparse vegetation, occasional trees, and the dry riverbeds of the Nossob and Auob rivers. The rivers are said to flow only about once per century; however, water flows underground, feeding the plant life growing in its riverbeds and the wildlife dwelling within it. The rivers may flow briefly after large thunderstorms, which is a momentous occasion and results in the wildlife flocking to the riverbeds and quenching their thirst. This allows for magnificent game-viewing for visitors to the Park. Over 300 bird species have been recorded in the Park and it is famous for its birds of prey. The Park's roads are not suitabe for sedan vehicles and 4x4 vehicles are necessary to explore the more unspoilt areas. Kgalagadi Transfrontier Park is a self drive destination and visitors have to be completely self sufficient for the duration of the stay. Union’s End is located 284 km from Two Rivers at the end of the predator rich Nossob Valley on the Botswana side of the Kgalagadi Transfrontier Park. The camp is nestled amongst tall Acacia trees and offers a spectacular view of the valley. The Rooiputs private concession area is located within the Kgalagadi Transfrontier Park on the Botswana side, 25 km north of Two Rivers. Situated off the predator-rich Nossob valley, the lodge is perched along a mature red sand dune, overlooking a waterhole. Ta Shebube Polentswa is located some 220km north of Two Rivers along the Nossob River Valley, and is nestled amongst trees and shrubs on top of a valley with far reaching views of the Polentswa Pan, famous for its magnificent sunsets and bird-watching. 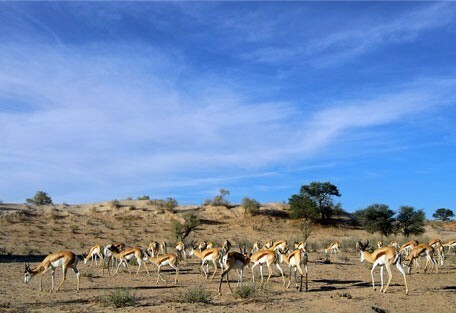 The pans are artificial watering points that attract gemsbok, springbok, hartebeest, eland and numerous other Kalahari species. 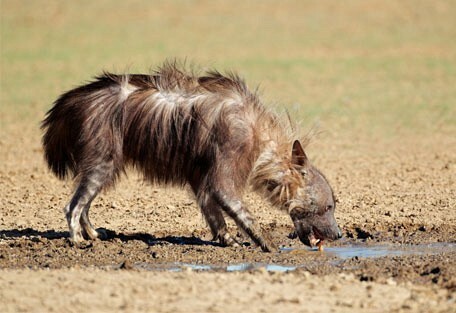 Brown hyenas and jackals are abundant and the famous black-maned Kalahari lions are about. 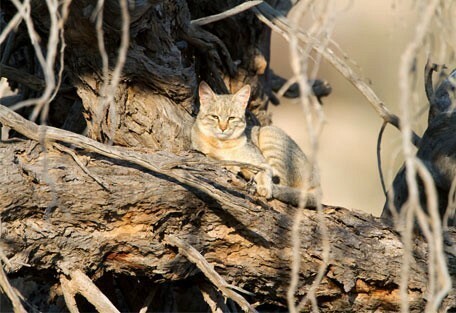 The best place to see the big cats is in the Nossob Valley. There are a huge number of birds of prey in the Kgalagadi and Black-chested Snake-eagles are abundant, as are Pale Chanting Goshawks. Other species include Gabar Goshawks, Lanner Falcons and Verreaux's Eagle-owl. Another special here is the Sociable Weaver nests, where thousands of birds nest together, each pair with its own private entrance to the huge community nest. The park has abundant, varied wildlife. 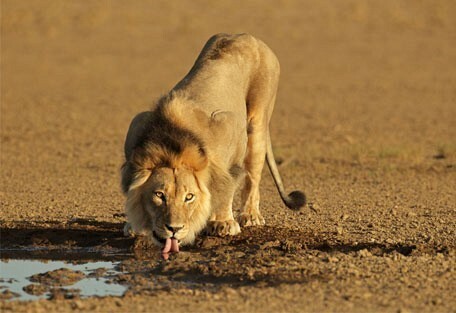 It is home to predators such as the black-maned Kalahari lions, cheetahs, leopards, and also hyenas. 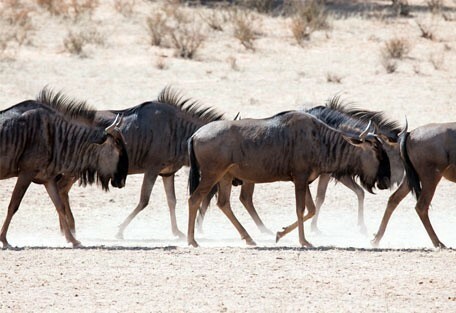 Migratory herds of blue wildebeest, springbok, eland and red hartebeest also live and migrate seasonally within the park. Union's End is the area were the Nossob river crosses from Namibia into the Kgalagadi Transfrontier Park and winds for 200km through the south of the park creating the border between Botswana and South Africa. Rooiputs is perched along a vegetated red sand dune, which is distinctive of the Kgalagadi, and boasts extensive panoramic views made up of acacia savannahs and grassy plains. Polentswa is located in an area of the Nossob River valley that is known as a bird watchers’ paradise and is rated as one of the best places in Southern Africa to view raptors. 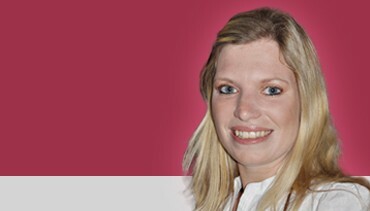 The weather in the Kalahari can reach extremes. Daytime temperatures in midsummer (December - February) are often in excess of 40 °C (104 °F), whereas winter nights can be quite cold with temperatures sometimes dropping to below freezing. Extreme temperatures of –11 °C and up to 45 °C have been recorded. Rainy season: Precipitation is sparse in this desert area (annual rainfall rarely more than 100 mm), but the rains usually fall during dramatic thunderstorms often accompanied by strong winds and dust-storms, which occur during the Summer months (November - April). The first rains transform the red dunes; covering them with fresh yellow flowers. Dry season: Winter (June to August), is when the air is dry and very clear days can be expected and the temperatures lie around 25 degrees Celsius; however the nights are extremely cold. Winter is also the best time for animal viewing. Because of the drought, the game is forced to come to the waterholes in the riverbeds.